Notes: While this title isn't an anime in the strictest definition of the word, we still feel that this movie deserves a chance to be recognized by anime fans all over the world. 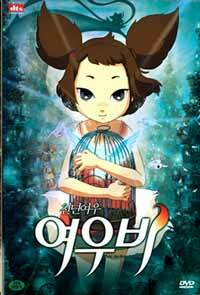 Yobi is a five tailed fox spirit who's living with a group of aliens. Wanting nothing to do with "stupid human beings", she resolves to join the aliens when they finish their spaceship repairs and take off for the stars. Unfortunately, the departure is delayed due to an accident involving one of the aliens. Even worse, because of the flaring tempers involved, said alien runs away and gets caught up in a school for children. Yobi changes into a human to try and get him out of his current situation. It's been some time since I had the opportunity to peruse an animated piece from Korea. I had for some time hoped that Empress Chung would eventually make its way to DVD, but so far that haven't happened. Still, the chance presented itself when someone recommended that I try Yobi, the five tailed fox. The fact that this particular movie was directed by none other than the director for My beautiful girl, Mari struck me as no bad thing, and it was pretty much the only encouragement I needed to pick up the DVD. Visually, the two couldn't be more different. Compared to My Beautiful girl, Mari, Yobi, the five tailed fox could probably not have been any more colorful and strikingly vivid. The town and the surrounding forest practically shines with life, and the alien's temporary home on earth is just a few rides away from being a full-fledged amusement park. And the prospect of aliens and their machinery aside, things like streetlights, or -- hell -- even the night sky is a study in near-firework-like assaults of color and light. It's happenin', baby. All flippancy aside, Yobi, the five tailed fox is a nicely animated piece of work. The character designs are purely cartoonic, particularly in regard to the furred, metal-diaper wearing aliens. If character movement might occationally come off as stiff and awkward at times... well, I guess that just goes with the territory for a movie that's most likely intended for children. As such, the first half of Yobi, the five tailed fox is undeniably comedic in nature. With a cast mainly made up of children and aliens, there's a lot of running and playing around, which suits a natural trickster like Yobi just fine. Still, she does find the time to befriend the leading male of the show, a boy named Hwang Geum-ee, who dreams about becoming a comedian. Well, at least according to the subtitles, but judging from his rather bizarre song-and-dance number, I'm thinking "entertainer" is a more appropriate term for it. Yobi seemingly adores it, though, which cements his status as the lead human character to mirror Yobi's fox-spirit self. Also, for an equally bizarre reason, Yobi's... erm... source of information seems to be a transparent, blue, flying basin. No, really. As with all movies starring (mostly) children, the story will inevitably touch upon the aspects of growing up. To go with that, there's also some random spiritual/mythological aspects to the whole deal that extends a little beyond the fact that Yobi is a fox spirit. How much of this is purebred fantasy made up for this movie, I can't really say. Nor do I want to go into it more than necessary, because they do, after all, make up the rest of the movie. Needless to say, Yobi will have to test herself and her companionship and love with her human friends before this is all over. Yobi, the five tailed fox is a strong movie. It really is, and I'm quite relieved to see something of this quality after a rather disappointing venture with Hammerboy. It's a welcome return to quality animation from Korea and a great example of why we're stretching our rules about anime reviews a little to allow it the promotion it deserves. Recommended Audience: I can't really think of anything regarding this movie. There's no real violence in it, nor is there any other material of questionable quality. It can easily be compared to Totoro or Kiki's delivery service. The DVD itself don't seem to be rated, so I'm going to have to put in my personal estimate here. There is a scene regarding some afterlife spirits that might come across as a little bit scary for the very youngest, though. Version(s) Viewed: R3 DVD, Korean language, English subs.